Are you investing huge capital on attractive posters for your restaurant and still not getting the expected outputs? Or still wrestling to attain a strong customer base at your restaurant? The notable reason behind the fall could be the one you were ignoring till date. Do you remember when was the last time you updated your menu? Exactly. This is the point where you lacked to bring the sales and customers. Nothing to bother anymore. We are here to acknowledge you the highlights of an alternative solution which will drive the customers towards your restaurant rapidly. Remember, your menu is just not a list of the food items, the menu actually represents your brand name. Maintaining the menu at the best level will be a stepping stone towards optimized sales and better outputs. Introducing digital menus have made the problem easy by offering us an automated & a cost-effective solution which can be updated anywhere, anytime. How digital menus can be significant for us and what is the need of deploying a digital menu in your restaurant? Take a look at the below points to get a clearer view of a digital menu. The traditional menu comes with a never-ending list of expenses including printing, designing, distributing, and other costs. In case of any changes in future, you can just replace it with a new one by wasting the huge capital. But getting a digital menu deployed offers you access to make changes, modify, and update anything on the menu anytime, anywhere. It's just a one-time investment service to enjoy the reliable services lifelong. So, instead of re-printing and re-publishing your menus, go for an online platform which makes the required changes instantly and accurately. A fully animated HD image with best resolution and contrast would certainly draw customers attention as compared to the boring paper menus. Ordering food becomes easy, interesting, and a worthful thing for customers. Looking for the desired food items becomes easy for them as the menu gets updated and rotates according to the meal timings. Thereby, offering an easy to search atmosphere. The HD images of food items added to the menu present a realistic view of your restaurant’s dishes and will surely attract the customers towards more add-ons in their order list. This eventually results in expanded sales with a circle of satisfied and happy customers. 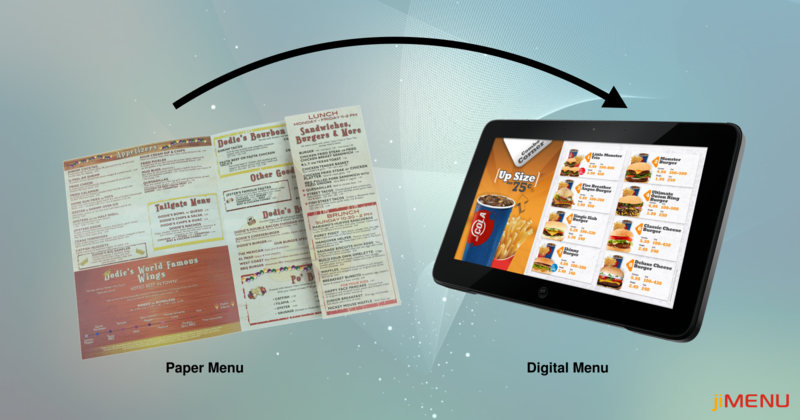 Deploying a digital menu is worthy in all aspects as compared to the traditional paper menus. From minimizing the waiting timings to skyrocketing sales, digital menu evolves out to be an upgraded form of the desired menu. Getting a menu which reduces your budget, increases your customers, optimizes your restaurant’s sales, and offers you customized solutions. What else do you expect in a menu? Its high time that you opt for a perfect digital menu provider and experience the surpassing features at your restaurant.